Powers/Abilities: Able to generate darkness and illusions, which she claims is done by calling upon shadow demons residing within her. History: Thirty years ago a genetic experiment was carried out by a secret organisation. They used the Philippines to test a DNA altering drug called Batch 72. The results were beyond their wildest dreams, with one in a hundred exposed gaining superhuman powers. After that it was difficult to keep the experiment a secret, and in the early 1980's the organisation's operations were publically exposed and discontinued. 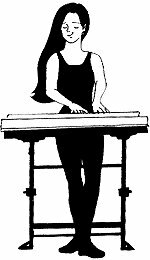 Kadi is the keyboard player in the band. She is also the granddaughter of an infamous supervillain, Doktor Kadiliman.